The rock band Godsmack performs in Bangor in October 2010 as part of the Waterfront Concert series. BANGOR, Maine — Waterfront Concerts has announced the next show in this summer’s lineup. 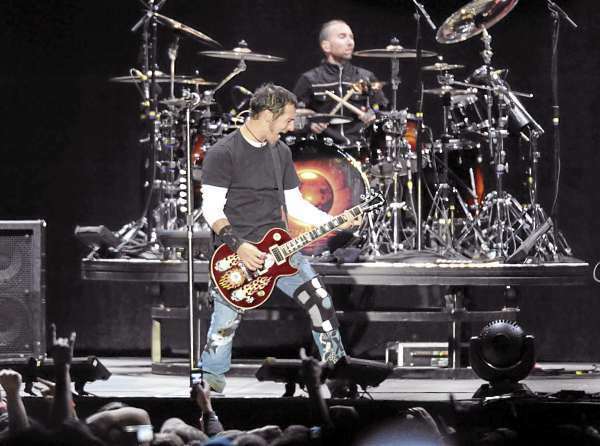 Godsmack, who had a popular show during the 2010 concert series, will return to the Bangor Waterfront on May 18, with co-headliner Staind. The Mass Chaos Tour kicks off April 13 in Georgia, and will make its way through the country until the Bangor date, which will be the last of the tour. Opening the show will be Black Stone Cherry. Tickets will go on sale Friday, Feb. 3, and are priced at $47.50 for general admission. There is no word yet on whether this year’s show will again feature an array of local bands, as 2010’s concert, billed as “Smackfest,” did. Staind’s seventh release, a self-titled album, debuted at number five on the Billboard charts in September 2011. Their song, “It’s Been a While,” was the rock song most played on the radio of the decade. Godsmack’s fifth album “The Oracle” was released in 2010, and a new album is slated for a mid-2012 release. The Godsmack and Staind show is the fifth show announced in the 2012 Waterfront Concert series. The other shows include Trans-Siberian Orchestra on May 9, Rascal Flatts and Little Big Town on July 9, Keith Urban on Sept. 1 and Jason Aldean on Sept. 2.